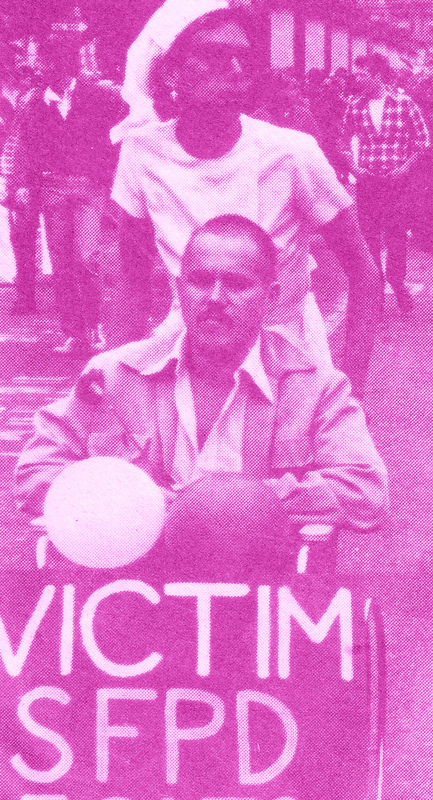 Pushing Mr. Sarah in the ’79 Parade a month after he was beaten in the White Night Police Riot. After several brain surgeries, 4 weeks in General and my skilled handling of his chair, he slowly started to recover. 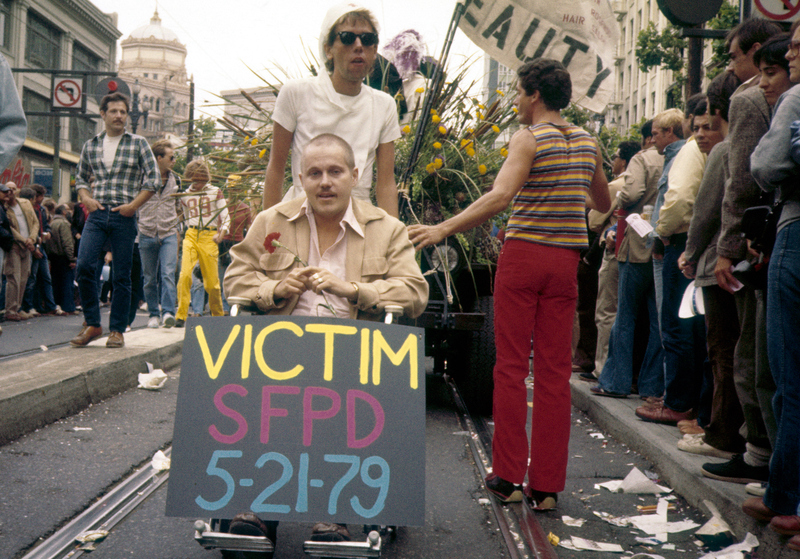 No self-respecting gay San Franciscan participates in the City’s vast grab for tourist dollars called the Pride Parade. Fortunately for the Visitors Bureau there are still enough self loathers left to lend it a somewhat local feel. Back in the day it was a street party where you’d run into lots of people you knew being silly and stupid. You would do bad things like get drunk on a Sunday afternoon and eat those awful barbecued turkey legs because it was the only food around. Once fortified you could go on to do other bad things. Then the parade became a destination vacation for millions of gays from around the world. It got to the point where you’d be lucky to run into one person you knew. The parade started going downhill for locals in the late 70’s. My favorite all time float was a truck towing a Mercury Cougar. On top of the car were punks with sledge hammers completely demolishing it during the course of the parade. On the side they’d spray painted “No Assimilation!” I doubt if their entry would pass muster with today’s Committee. The folks from Omaha just wouldn’t understand. This year on Pride day I made plans to go with my friend Leigh. I love hanging with her because she has zero tolerance for the banal. I’ve been at the theatre with her where we’ve realized after 15 minutes the play was a dud and she’s turned on a dime, “we’re out of here.” None of this “respect the artist” or “we paid good money for these seats” crap. That Sunday we decided to go down to the Civic Center to check out the scene. After a late start we hooked up on Polk at 3:00 and walked towards the action. I was astonished that the event which was huge years ago had gotten even bigger. It used to be a stretch to say that a million people attended, million might now be plural. It was claustrophobic but fascinating. So many young people in their underwear, so many old people in items they should not be wearing in public. We watched the dancers a bit, goofed on the odd balls, but basically just tried to stay in visual contact as we fought through the crowd on our way to Zuni. The last time I went to Zuni on Pride we sat down and had a late lunch. Not a chance this year. Apparently a decade or two ago it turned into a (mostly) Lesbian hangout on the day of days. It was one huge bar scene spilling out into the street and side alley. Cars detoured into the center of Market to bypass the people but Muni had to sit there and lay on the horns so they could turn right on to Haight. Getting up to the bar was impossible but Leigh, in her inimitable way, had our Margaritas in no time. They were so potent we decided to have a second. After a couple sips it was time to leave, we walked up Franklin Street drinks in hand. I did 60’s poses on how to hold a cocktail while she worried we were going to be busted. The fates were with us and the cops otherwise occupied. We avoided the drunk tank. The carnival spirit of the day made me rethink my animosity towards Pride. I would never begrudge anyone for having such a good time. Still, something about it just doesn’t smell right. As Mayor Ed Lee, Ron Conway and the real estate developers destroy the fabric of gay life in San Francisco, the City still puts on a good party. But that party benefits City coffers not the gays and lesbians who live here and who are being forced out in droves.